If Indonesia did not exist, the earth’s day would be significantly shorter than the approximately twenty-four hours to which we have become accustomed. This would have a dramatic impact on the clock industry, of course, and familiar phrases like “twenty for/seven” would have to be modified. But Indonesia does exist, and its seventeen thousand islands, together with a complicated multitude of underwater trenches, basins, channels, ridges, shelfs and sills, continue their daily work of diverting, trapping and otherwise disrupting one of the most voluminous flows of water on earth, a task that consumes so much energy that s slows the very spinning of the globe. The flow that passes through Indonesia is called the Indonesian Through-flow (ITF), and was first noted be oceanographer Klaus Wyrtki in 1957. Its source is the Philippines Sea and the West Carolin Basin, where the incessant blowing of the Trade Winds and the currents they generate, have entrapped water from great expanse of the Pacific. In the Pacific Ocean northeast of the Indonesian archipelago, the sea level is 20 cm above the average; in the Indian ocean south of Indonesia, because of similar forces acting the opposite direction, the sea level is 10 cm below average. This 30 cm differential sets in motion massive amounts of water. The volume of this flow is so great that familiar units like cubic meters and gallons quickly become unwieldy, so oceanographers have invented a unit they call the “Swerdrup”, named after Norwegian scientist Harald Swerdrup. One Swerdrup is a flow of one million cubic meters per second, which is a lot of moving water. Think of a river one hundred meters wide, ten meters deep, and flowing at two knots, and than imagine one thousand of these rivers that is one Swerdrup (100 km wide river of 10 meters depth fast as 2 knots). The Indonesian Trough Flow, scientist estimate, represent 15 Sv, or 15 000 rivers like this (1500 km wide river of 10 meter depth fast as 2 knots). Three quoters of this flow is carried in the upper few hundred meter, and the rest moves through Indonesia’s network of deep basins. The seasons effect the rate of ITF and it is strongest during the southeast monsoon, peaking in August. 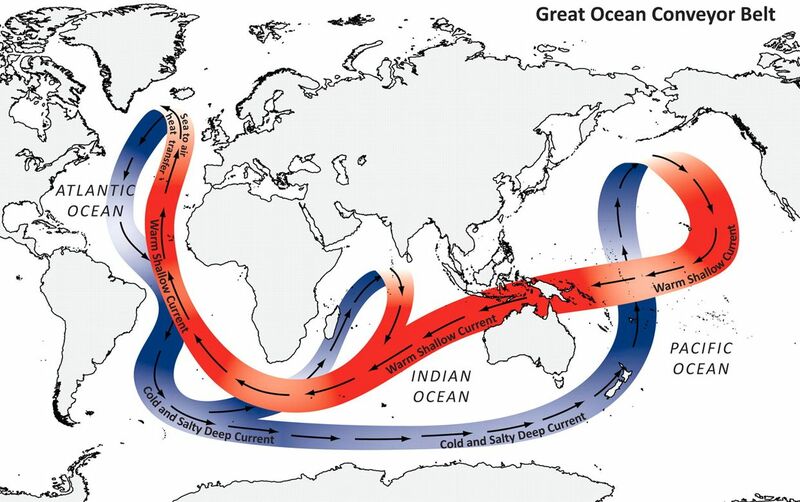 Only think which can disrupts this mighty power is even mightier El Nino which by diverting the Equatorial Trade Winds pushing the water east, away from Indonesia. Next time when we are together under water somewhere around Bali and the bubbles instead of going up start to spin around you in a wild dance of ocean tango you would at least understand why.